Fantastic Mr. Fox: 8.5 out of 10. In a word, this film is fantastic. Betcha didn't see that coming, eh? This is one of those rare films that fulfils both the 35-year old and the 7-year old. I can personally attest to this. It nails both audiences in terms of story, dialogue and visual appeal. And that visual appeal is something special. I just enjoyed looking at this movie. They could have muted the audio and I'd have been mesmerized. This movie looks unlike any animated film I've seen previously. It's stunning. And that story and dialogue... charming and funny as cuss. As a big fan of previous Wes Anderson efforts like Bottle Rocket, Rushmore and The Royal Tenenbaums, this is another W.A. gem, with the voices of your usual W.A. movie suspects. 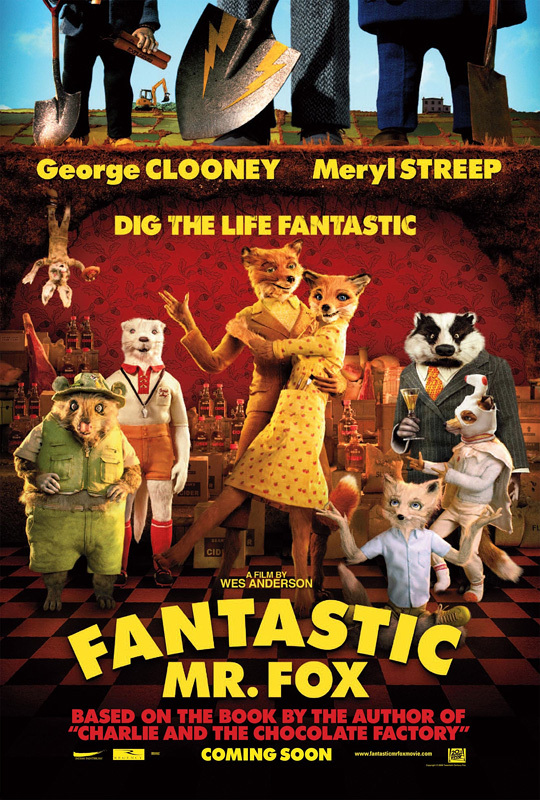 Bill Murray, Jason Schwartzman and Owen Wilson all contribute, but it's George Clooney who perfectly captures the essence of Mr. Fox. Cuss, I'm going for it one more time. See this movie, it's fantastic. Can't wait! My 11 year old boy is a big fan of Roald Dahl (as am I). It is so nice to see his work brought to life on the screen.